The University of Cumbria was formed in 2007 and is one of the UK’s newest and most improved* universities. The uni has a number of compact campuses in North West England at Carlisle, Lancaster and Ambleside, located within a short walk of the city and town centres, with additional sites in London and Workington. At any campus there is plenty to see and do in your free time in the surrounding areas, including the Lake District World Heritage Site on your doorstep in the north west. As part of the university’s continual support and commitment to securing you great career success, they are now offering you the opportunity to master your subject for free. Study an undergraduate degree at the university and they will waive the fees for selected postgraduate courses. Find out more about the PG offer here. There is a strong emphasis on vocational study in the subject areas the university focuses on. Many teaching staff have experience in industry and links to business and a lot of courses offer placement opportunities. The Careers and Employability Service are based in the libraries across all campuses and offer one to one appointments, workshops, a job shop for part-time opportunities as well as information on the Career Ahead Award, designed by the uni to prepare you for the world of work. 97% of students are in work or further study within six months of graduation. Reviews praise the fact the university offers careers advice right from the start as well as the variety of opportunities they provide to enhance their CVs. Many courses at the uni are professionally accredited and students benefit from small study groups thanks to its low student population of under 8,000. Reviews often praise the knowledge of the lecturers as well as the teaching methods which go beyond just sitting in lecture halls. 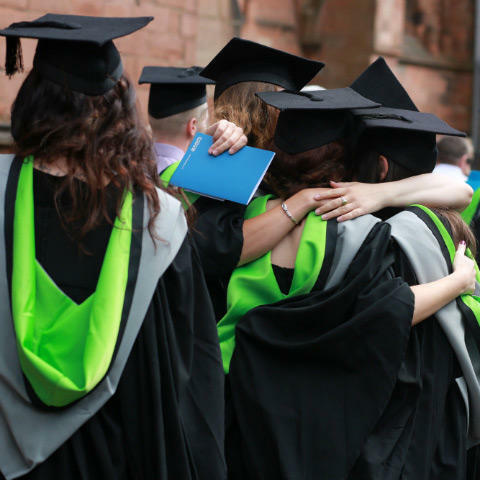 Law, musical theatre performance and psychology are all ranked in the top three of North West universities while art, design and craft is in the top five. The University of Cumbria is the largest provider of outdoor study degrees in the UK. The Ambleside Lake District campus means the outdoors is just a step away. The students’ union is a student-led charity which manages a range of societies and sports clubs. Student Academic Reps are part of the SU and provide a channel of feedback between students and course providers. The SU also arranges volunteering opportunities for students. There are halls of residence providing affordable accommodation at Ambleside, Carlisle and Lancaster campuses. There are over 1,000 rooms available with a range of en-suite and shared facilities. The university also leases local houses from accredited landlords who meet uni standards on behalf of students. Students praise the specific subject facilities the university offers in their reviews, as well as the range on offer. The Learning Gateway at Carlisle, Fusehill Street campus is a space for flexible learning with lecture theatres and video conferencing facilities. At the Carlisle, Brampton Road campus there is also a Graphic Design and Illustration studio and a Ceramics department with large studio space, workshops, a plaster room, throwing area and kiln room. There is a textile print workshop for Art students and a computer suite with digital scanning and drawing equipment. The sporting facilities are run by the Register of Exercise Professionals accredited staff and include a fitness suite and sports hall. Lancaster also has an Astroturf pitch. The Physiotherapy and Sport Laboratory is based in Carlisle and is used for investigating human performance by Physiotherapy and Sports and Exercise Therapy students. There are campuses in Carlisle, Lancaster and Ambleside. These student-friendly places are affordable with good transport links. Carlisle and Lancaster benefit from regular, direct rail services to Manchester, Birmingham, London, Glasgow and Edinburgh. The campuses are served by the West Coast rail network and are near to the M6 motorway. The Lake District National Park and beautiful coastlines are nearby offering plenty of opportunity to explore the great outdoors. There are plenty of clubs and societies to join at Cumbria. If you join one of the sports societies you can compete nationally in the British Universities and Colleges Sports League. Reviews were positive about the variety and inclusivity of clubs and societies available at Cumbria. The SU offers a free independent support service via the Information and Advocacy Service. You can also get advice on a one to one basis regarding a range of academic or welfare issues. There is also a sexual health screening service and contraception is provided by the Free Condoms service. Reviews are very positive about the support available, both the academic and the personal. Students feel that staff are helpful and friendly and that they get the support they’re looking for. UK Students per Year: £9,250. There are 240 awards worth £3,000 in total (£1,000 per year) and 50 awards worth £4,000 in total (£1,000 per year) for students from low income families (less than £25,000). Up to £1,573 for students with children, dependent on household income. A childcare grant is also available, where 85% of weekly childcare costs can be paid up to £155.24 a week, depending on household income. Dependent on household income, students who have adult dependants can receive up to £2,757. For more information on bursaries and scholarships, go to the university’s website. Students who achieve Early Years Teacher Status are qualified to begin work as a teacher in a pre-school, nursery or early years setting. The uni boasts that over 70% of schools in Tower Hamlets in London have teachers from the University of Cumbria. The uni has a practice based approach with small class sizes of around 30 per year. There are new dedicated studios for arts students to help you master a wide range of disciplines with access to a professional printmaking studio, a wet darkroom, 3D sculpture workshop for woodwork and metalwork and an audio video suite for filmmaking. Entry requirements vary from course to course, please check the university website for further information. Is there the option to study abroad at this uni? This is the average cost of a pint . This is the average annual cost for a full time student at this uni. This is the average annual cost of living for a student studying in the town where this uni is based.